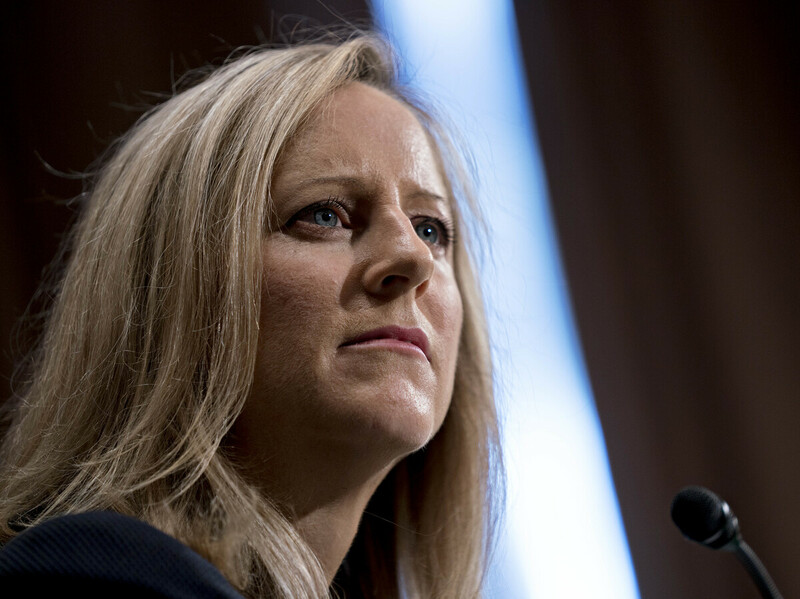 Senate Confirms Kathy Kraninger As CFPB Director The White House official has been confirmed as the Consumer Financial Protection Bureau's new chief over objections by critics who highlighted her lack of experience in consumer protection. She will succeed her OMB boss Mick Mulvaney, who has been the CFPB's acting director, for a five-year term. An associate director for general government at the OMB, Kraninger, 43, held prior jobs at the departments of Homeland Security and Transportation. Kraninger's appointment is another slight by the Trump administration against the CFPB, an agency Mulvaney has worked to weaken from within. The White House has said she is the "right leader to reform and refocus" the agency. Kraninger has said that "under my stewardship, the bureau will take aggressive action against bad actors who break the rules by engaging in fraud and other illegal activity." "I have the utmost confidence that she is well prepared to lead the bureau in enforcing federal consumer financial laws and protecting consumers in the financial marketplace," Committee Chairman Mike Crapo, R-Idaho, said at Kraninger's hearing. They contended she was an architect of the federal government's "botched" response to Hurricane Maria in Puerto Rico. "Instead of turning to help them you pinched pennies," said Sen. Bob Menendez, D-N.J.
"That does not give me the faith that when you have to stand up for seniors, service members, students, homeowners against some of the biggest financial institutions in this country that you'll do that," Menendez added during the hearing. Democrats also said Kraninger played a key role in overseeing the Trump administration's policy of separating immigrant children from their families at the border. "These are innocent children who may be scarred forever by this policy," said Sen. Elizabeth Warren, D-Mass., who helped create the CFPB. "It is fundamentally immoral and you, you were part of it Ms. Kraninger. It is a moral stain that will follow you for the rest of your life. And if the Senate votes to give a big promotion to you after this, it is a stain on the senators who do so." At her hearing, Kraninger declined to answer questions about the specifics of her roles in those policies. "I don't think it's appropriate for me to get into the details of my advice" to agencies, she said. But Brown, a Democrat who is now an Ohio senator, said at the hearing: "I can't think of a professional reason that she's qualified for this job." Dozens of consumer and civil rights organizations, including the AFL-CIO, the NAACP and Public Citizen, signed a letter to the banking committee this summer, decrying her nomination. As director, she would "continue in the line of the dangerous leadership" and "prioritize the interests of industry over consumers and the rule of law," they wrote. In a statement, Karl Frisch, executive director of the consumer advocacy group Allied Progress, said: "Rather than reward her with a promotion she does not deserve and is not qualified for, Senators should have refused her nomination. The mission of the CFPB is far too important to be placed in the hands of someone who lacks candor and experience at such a fundamental level." Mulvaney's appointment was viewed as a slam of the agency by the Trump administration — the Republican once sponsored a failed bill to shut down the CFPB altogether. The former congressman, who splits his time as director of the OMB, has worked to make the watchdog agency less aggressive. In his time as interim director, Mulvaney dismantled the agency's consumer advisory council, delayed a new payday lending regulation and saw key CFPB leaders resign, citing his leadership. Democrats have pledged to examine the aftereffects of Mulvaney's tenure once they take control of the House in the new year. "I call on Director Kraninger to put consumers first by rolling back the anti-consumer actions taken by her predecessor and allowing the Consumer Bureau to resume its work of protecting hardworking Americans from unfair, deceptive or abusive practices," Rep. Maxine Waters, D-Calif., said in a statement after the confirmation vote.